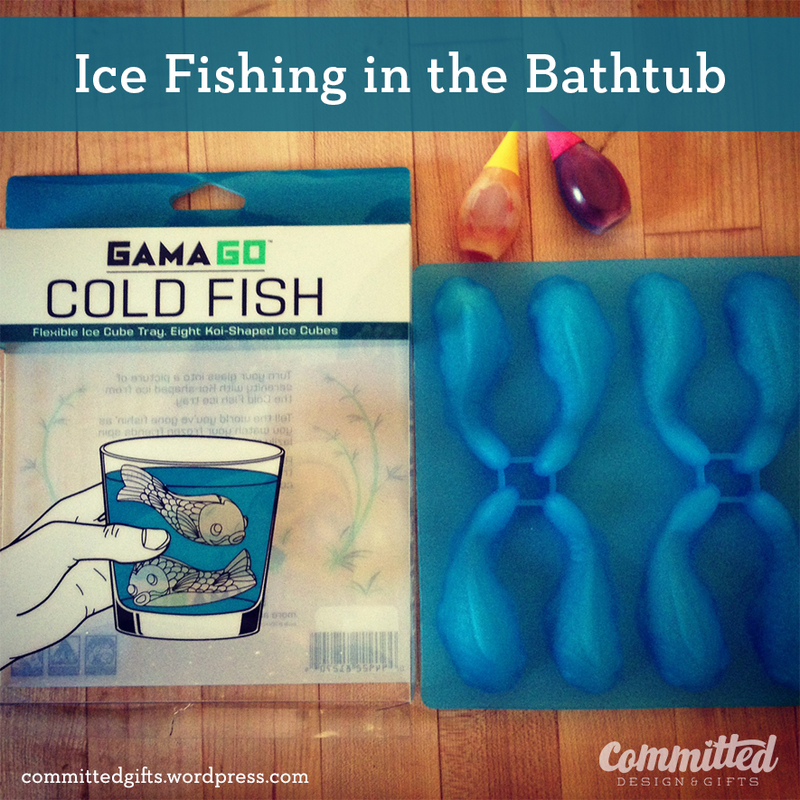 Ice Fishing, Bath-Style | Committed. The last week has been a torrent of tears at bathtime. My husband’s mostly…just kidding…kind of. But seriously, for some reason, the kiddo just keeps FREAKING OUT when it’s time to splash around. And we need to do it–with the hotter Seattle days, sweat and sunscreen and general toddler messiness require daily hair washing. Or at least rinsing. Anyway, we took a nice long walk this weekend and stopped in an adorable gift shop to browse. 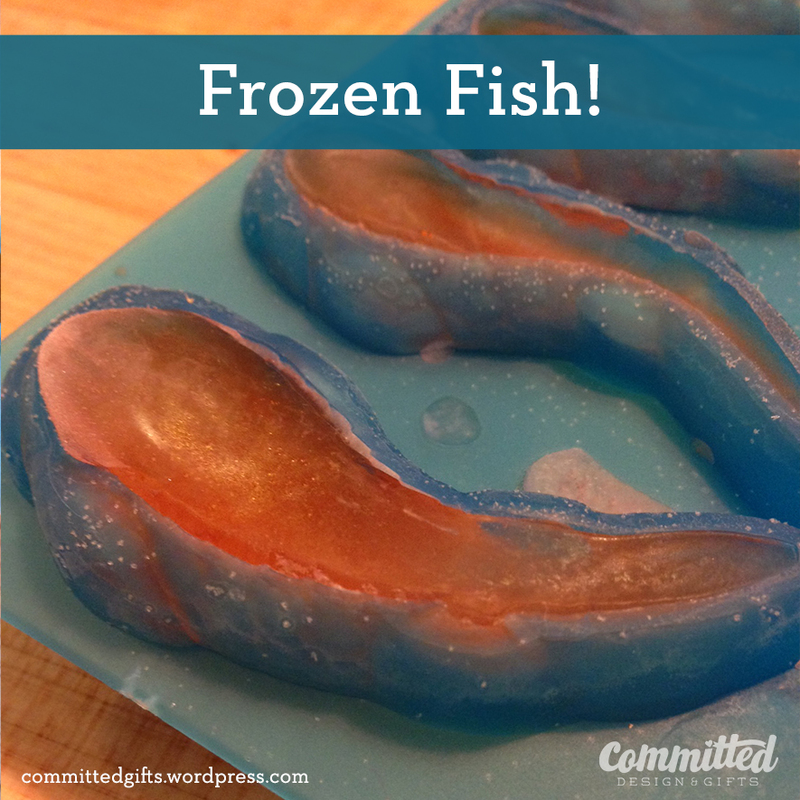 I saw these fish ice cube trays and it hit me: I could make colored ice fish for the bath! Thunder struck, the heavens opened, and I was overjoyed at the prospect of a peaceful bath that night. 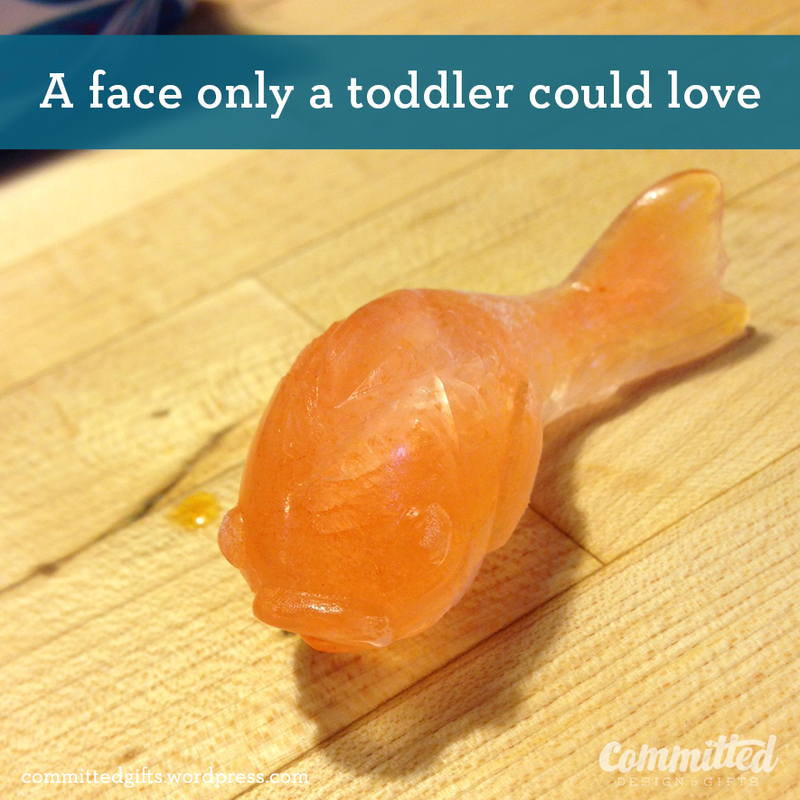 Water, food coloring, and silicone molds are my gateway to bathtime happiness. 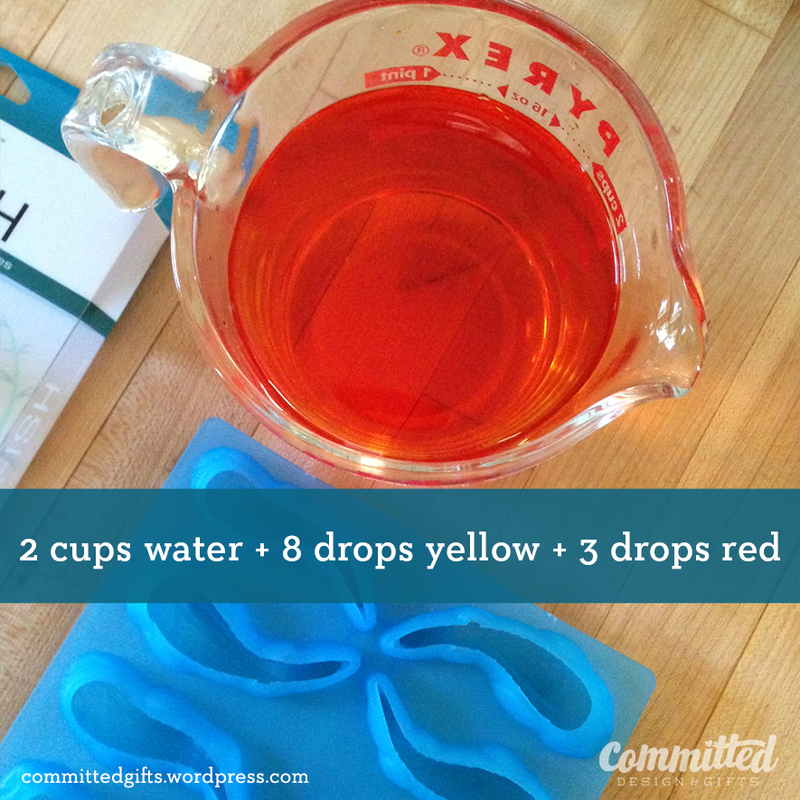 I stirred a few drops of color (about 10-12 total) into a 2-cup Pyrex measuring cup. I poured messily. I blotted daintily. I froze carefully. Keeping the color enough to be interesting, light enough to not stain. This was tricky. And messy. I kind of cheated with this photo. They froze solid in a few hours. I’m glad I filled these completely, because unlike regular rigid ice cube trays, the silicone expands with the ice. Normally, I’d say don’t fill them full, but FILL THEM FULL. You want the full shape to pop out. And how awesome and intricate is the shape?!? This popped out really easily. It’s freakishly realistic, except for the cold. See? Enough color to tell what it is, but hopefully not enough to turn my kid orange. Hopefully. And let me tell you…she was ECSTATIC! I mean, not only no tears, but excited and happy to have these little melty friends join her in the tub! It was a fun lesson in melting and temperature, how ice turns to water, blah blah. Really, I was just relieved she was able to enjoy herself. The color slowly enters the water as the fish melt. Sorry the photos are so blurry, but I promise this was a success. I thought she might get upset at her new friends disappearing before her eyes, but she thought it was the coolest thing. Oh, and she did NOT turn orange. All told, each fish had about 1/2 drop of color in it, so you do the math. This has been our saving grace for 4 baths now. 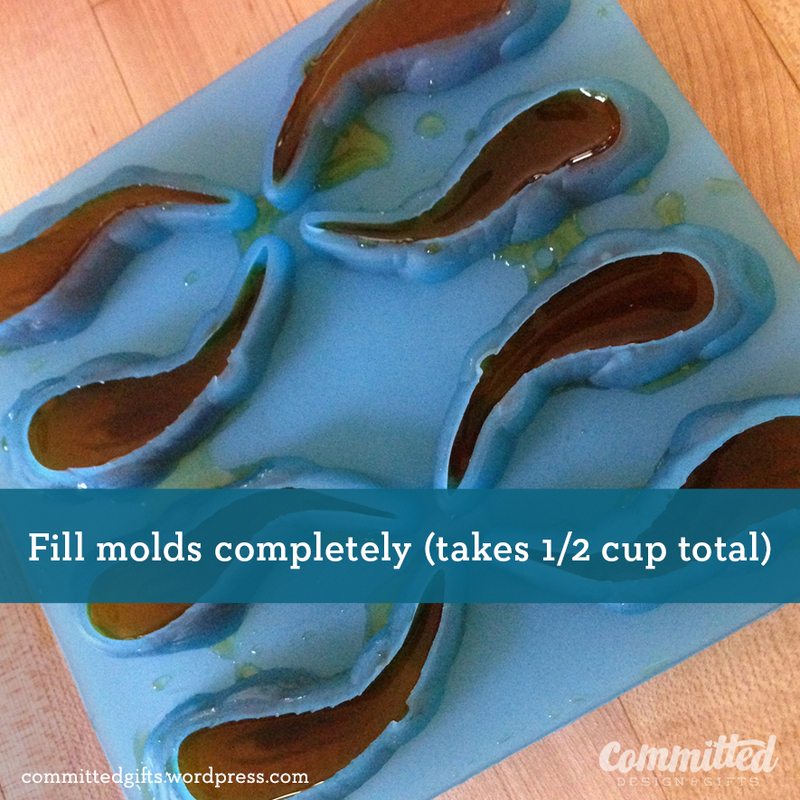 Oh, and remember these silicone molds I used to make crayons? 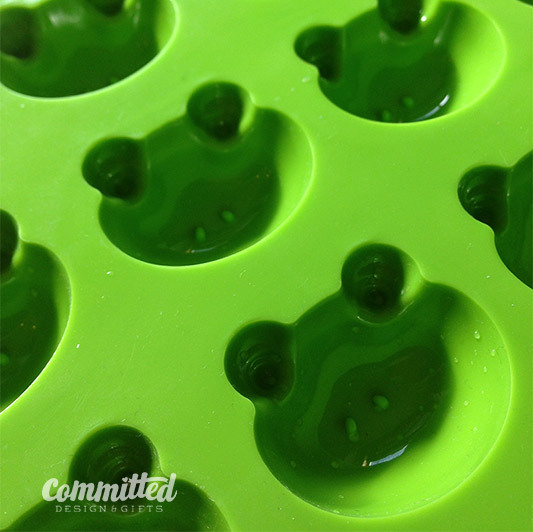 This froggy mold came from Japan, but you can get yours at Ikea. Guess what? I made blue froggy ice cubes for the next night! Equal success! Anyway, I’m kind of proud and excited about how easy this was and how well it worked. 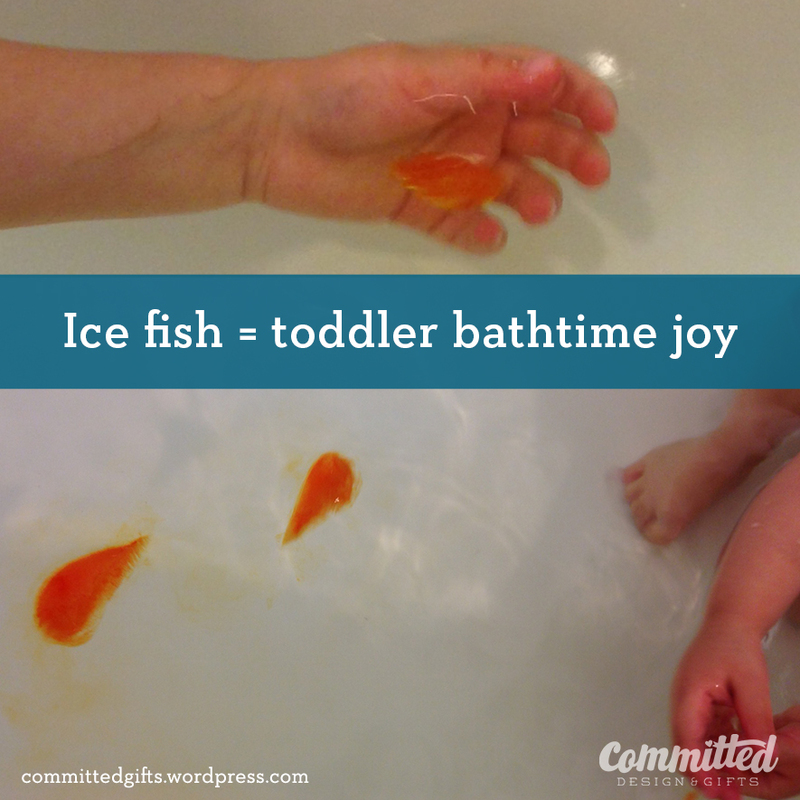 Tell me, friends, what are some of your favorite bath time pastimes? Great idea. I’m sending it to my granny friends & relatives. Glad that bath time is back on track. Wow! This is so cool!! I need to try! Just be warned: you may never be able to have a bath without them again! Good luck!